Blackpool and Doctor Who star David Tennant. Staff at a Doncaster pub are set to cycle 114 miles to a pub built on the site of a popular TV series starring former Doctor Who David Tennant. Fourteen colleagues from the Red Lion in the Market Place will hop aboard their bikes next month for the charity off-road challenge which will take them across the Pennines to a pub that occupies the site used to film 2004 musical comedy drama Blackpool in the Lancashire seaside resort. The group will be raising funds for children's cancer charity CLIC Sargent en route to the other side of the country where they will arrive at the seafront pub which once enjoyed national television exposure. The Velvet Coaster, which, like the Red Lion is a Wetherspoon pub, was built on the site of the Lucky Star amusement arcade which was the setting for the six-part series which starred David Morrissey as an unscrupulous arcade owner suspected of murder and David Tennant as a detective brought in to solve the case. The role came just ahead of the latter becoming Doctor Who and the star of ITV crime drama Broadchurch. The pub – one of the biggest anywhere in the UK and just a stone's throw from Blackpool Pleasure Beach opened in 2015 after the arcade was demolished to make way for the £3.86 million venue. 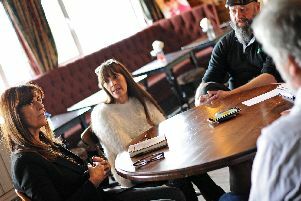 The historic pub, the birthplace of Doncaster's St Leger horse race, was closed for five months while work took place with new furniture, carpets, fixtures and fittings introduced. The work also included a conservatory style extension as well as the new beer garden as well as a 14-bedroom hotel on the first and second floor of the building. The bike ride will take place on July 22 and a spokesman said: "The staff will be covering a total of 114 miles in one and a half days on mountain bikes with the route being all off-road." David Morrissey outside the Lucky Star arcade in Blackpool. Customers can support the team's charity efforts by donating in collecting tins which have been stationed on the bar at the Market Place pub. The former Lucky Star arcade in Blackpool. The Velvet Coaster in Blackpool.